I’ve been putting this job off for far too long because (a) i’ve never liked chainsaws (too much noise and smoke and balky engines etc.) and (b) i HATE Smilax aspera (aka Saprarilla), that thorny climbing bindweed that strangles and ultimately chokes the life out of any tree that it can gain a purchase on – not to mention what it does to every unprotected part of your body that brushes against it, which will certainly happen if you dare to approach its host tree. 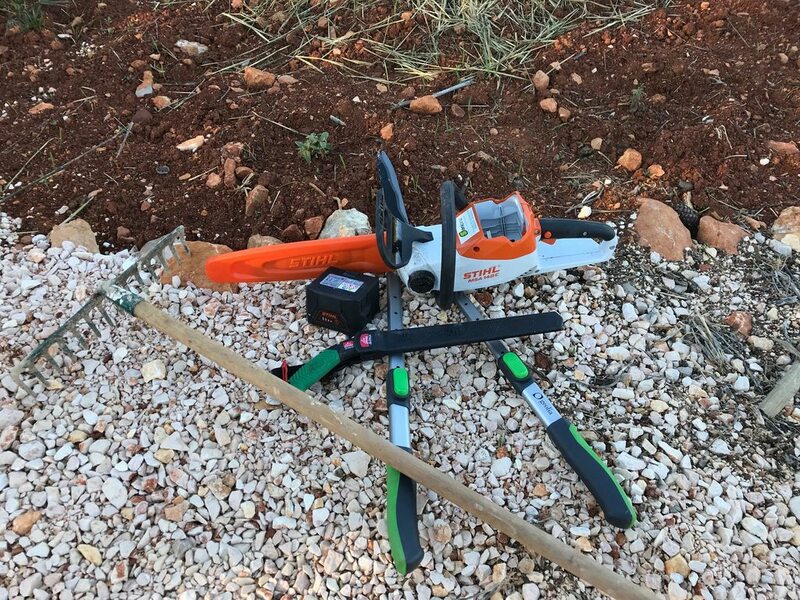 Fortunately, Santa was good enough last Christmas to give me just the kit i needed for this job (see picture below): a battery-powered chainsaw (yes, i said BATTERY! makes short work of a pruning job like this on a single charge, & cuts as well as its petrol-powered twin, about as quietly as your home Hoover. Who knew? ), plus a few hand tools that will be familiar to any of you with gardens. The long-handled (telescoping) shears are essential for cutting those nasty climbers (you can see the forest of stubs on the ground and overhead in the photo above), the stiff-tooth rake for pulling all those nasties away (fortunately they make for a nice tumbleweed when raked together), so then you can go in with your choice of saw. I still like the hand-saw for closeup & one-handed work; this little Stihl is one-handable, but that is always risky. So: since i got the tools & the workflow down, i’ve been moving along from one overgrown tree/copse to another, giving priority to the centenary trees for now; any tree that’s been around for 100 years holds some important lessons for me to learn, i figure. 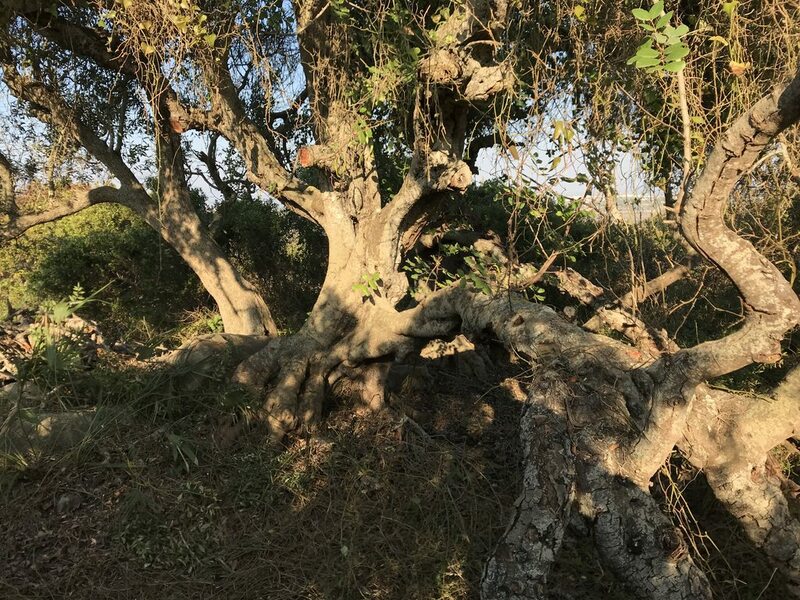 Got a good handful of carob trees sorted already; am moving on to the great old olive trees that can offer much-needed shade to the sheep that will be grazing our south slope pastures in the months to come. The problem is: when it comes to pruning for fruit production, which is an important consideration as well, i’m not so confident in the decisions i am making about where exactly to cut. Good thing is: i know just the guy to call when it comes to this sort of thing… And so i did, and so it’s confirmed: we’re gonna have Peter Zinn onsite the last week of this month, to lead the little tree-cleaning team i’m presently putting together. [*] It’s hard work -not so much the cutting, but the dragging/ chopping/ chipping involve in making firewood and hedgerows and sheep-fences etc. does generally involve a bit of heave-ho. But it’s good work, and highly rewarding, to see these beautiful old trees emerge from what was once an impenetrable tangle. So: if this sounds like your idea of a good time, and you’d like an opportunity to learn from one of the best (which Peter is widely acknowledged to be, in this particular corner of the world for sure), then do send me an email to advise of your interest. PS: for more/ higher-rez pics, you can visit this gallery at Imgur (a good place for free storage of large images/ galleries, i have found).